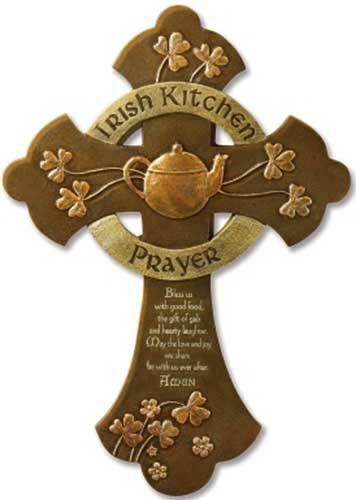 This Irish kitchen blessing plaque features a dimensional Celtic cross that is ready to hang on your wall. The Irish kitchen Celtic cross is made of resin that is enhanced with soft metallic painted highlights that included a tea pot along with shamrocks and the blessing. This Irish kitchen blessing cross measures 8 31/2" wide x 12 1/8" tall. This Irish kitchen blessing is gift boxed with Celtic cross and shamrock history cards, complements of The Irish Gift House.